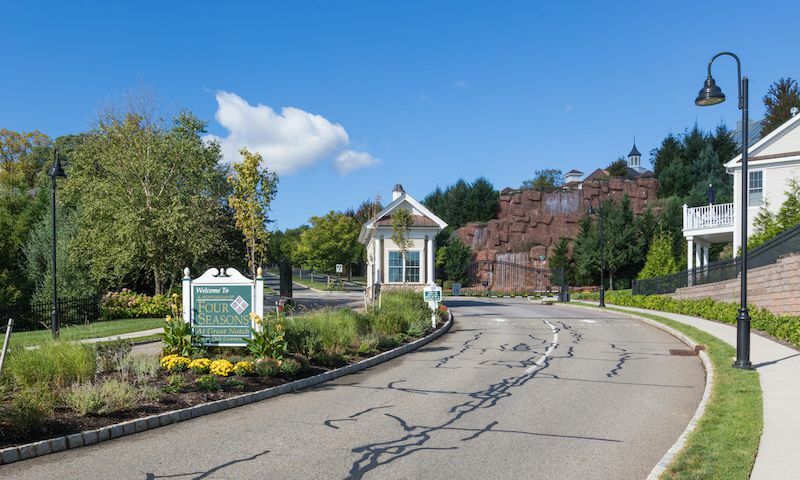 K. Hovnanian's Four Seasons at Great Notch Spa and Club is an active adult community situated in the middle of a mountain rock quarry in Passaic County, New Jersey. This gated community actually sits in two different towns - Woodland Park and Clifton. Four Seasons at Great Notch is located only twelve miles from New York City, but provides a tranquil rural setting while offering easy access to major highways, as well as train and bus service. This 55 and over community includes a world-class clubhouse with resort-style amenities and a renowned lifestyle with magnificent views of the Manhattan skyline. Off site, residents can discover a variety of country clubs, lush parks, fine dining, and boutique shopping. With a variety of finely crafted villas and condos to choose from, Four Seasons at Great Notch Spa and Club is the perfect resort-at-home living destination for active adults. The extraordinary 25,000 square-foot clubhouse hosts an abundance of amenities suitable for today's active retirees. It includes a fitness center with aerobics studio for healthy workouts and an indoor pool for aquatic exercise. There are also a variety of hobby and craft rooms, a well-stocked library, billiards, and a grand ballroom. In addition, there is a cozy fireplace lounge area. The grounds of Four Seasons at Great Notch Spa and Club include tennis facilities, bocce ball courts, and a putting green and driving range. A sparkling outdoor pool for those hot summer days rounds out the amenities at Four Seasons at Great Notch Spa and Club. Construction started in 2005 and K. Hovnanian plans to build 814 homes. K. Hovnanian offers garden homes, courtyard homes, and villas with a total of twelve different home designs at Four Seasons at Great Notch Spa and Club. The garden homes are condominium style residences with elevators and covered parking. These condos come in six different floor plans, which are designed to offer between 1,426 to 1,765 square feet of living space. They have two bedrooms, two or two-and-a-half baths, and one-car garages. The villas are similar to large single-family homes, but are attached in two-story buildings with two-car garages. They offer between 1,652 and 2,281 square feet of living space. Home association fees are the same for all three housing options. The two-story courtyard homes are like large townhomes with full basements and range in size from 2,162 to 2,907 square feet. These townhomes have two or three bedrooms, two or three bathrooms, and two-car garages. The residents of Four Seasons at Great Notch enjoy thoughtfully planned and beautifully designed living spaces and can choose from many interests to design a well-rounded lifestyle that matches their interests. A full-time activities director is on hand to help fill the social calendar with many planned events and fun excursions. In addition, residents can join existing clubs and interest groups or start new ones. Some of the existing groups are knitting club, Mah Jongg, restaurant club, tennis group, movie club, billiards, bridge, poker, and bocce ball. Besides shopping and dining, the area of Woodland Park and Clifton offers plenty of opportunities for outdoor recreation. Golf enthusiast will enjoy any or all of the following country clubs: Essex Fells Golf Club, Greenbrook Golf Club, Upper Montclair Golf Club, Arcola Golf Club, Deer Run Golf Club, and Meadows Golf Club. Outdoor explorers will find Garrett Mountain Reservoir, Eagle Rock Reservoir, West Essex Park, Preakness Valley Park, and Saddle River Park to their liking. New York City is only twelve miles away from Four Seasons at Great Notch Spa and Club and the Newark Liberty International Airport a mere 30 minutes. Four Seasons at Great Notch is the perfect active adult community in Northern New Jersey. There are plenty of activities available in Four Seasons at Great Notch Spa and Club. Here is a sample of some of the clubs, activities and classes offered here. There are six condo models that range from 1,426 to 1,765 square feet. These homes feature two bedrooms, two bathrooms and a one-car garage. There are four villa models that range from 1,652 to 2,281 square feet. These models have two bedrooms, two or two-and-a-half bathrooms, and a two-car garage. There are two courtyard floor plans that range from 2,162 to 2,907 square feet. These homes feature two or three bedrooms, two or three bathrooms and a two-car garage. This is north Jersey's best 55+ community! It is so close to NYC and all the area has to offer. The gated entrance and waterfall make a dramatic impression every I arrive. The clubhouse is among the best I've seen and very active! Great community sitting up high on a bluff. Homes are great and the location is perfect! We are very impressed with this community! The clubhouse is gorgeous and everything is very high-end. It is a wonderful neighborhood and we are just thrilled to be living here. Our home is great and we have not had one single problem with it. 55places.com is not affiliated with the developer(s) or homeowners association of Four Seasons at Great Notch Spa and Club. The information you submit is distributed to a 55places.com Partner Agent, who is a licensed real estate agent. The information regarding Four Seasons at Great Notch Spa and Club has not been verified or approved by the developer or homeowners association. Please verify all information prior to purchasing. 55places.com is not responsible for any errors regarding the information displayed on this website.